I recently hosted a small swap on Swap-Bot. The theme was Calm & Comfort. 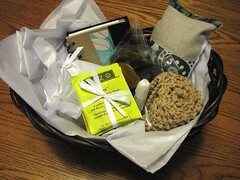 Participants were to make up a small parcel filled with goodies that were calming and comforting. It was interesting to try to figure out various goodies that were based on the theme. I basically ended up with a spa-in-a-box.... or basket, as is the case. Included inside the basket are various "jams and jellies" (as Candace Olsen calls them) for the bath, soothing teas, a small dream journal, a hand-knit washcloth in natural cotton, and other goodies including a handmade eye pillow. I ended up making extra eye pillows to include in my Etsy shop. The basket was fun, and I loved how it ended up!